(Reuters) - Laos's secretive Communist Party unveiled a new central committee on Friday from which the prime minister and incumbent party chief were absent, signaling their political exits after they opted out of re-election at a party congress. Party general secretary and president Choummaly Sayasone, 79, who has held both posts since 2006, and Prime Minister Thongsing Thammavong, 71, were among four politburo members who did not apply to join the top committee, according to a state media announcement. That puts them out of contention for elite politburo and party chief posts, say experts. The new 77-member central committee was due to choose those positions on Friday. The top name on the central committee list was 78-year-old Bounnhang Vorachit, the current vice president, who has been tipped to become the next chief of a party that has run Laos for four decades. Second on the list was National Assembly chairwoman and former central bank governor Pany Yathotu, a development that suggests a bumping-up in the party hierarchy to be a possible prime minister, according to Martin Stuart-Fox, a retired professor and expert on Laos at the University of Queensland. "The most significant promotion has been Madame Pany," he said, adding she was now "a very powerful figure". Analysts have anticipated a continuation of a status quo that has seen power tightly controlled by the party while pursuing strong economic expansion, which has averaged 7.8 percent since 2011. All 39 central committee members who applied to run again were chosen for another term, state media said. 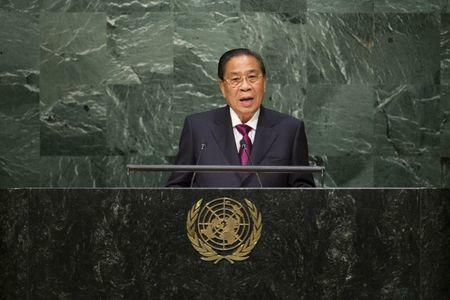 Laos has close political ties to communist Vietnam and mirrors its political system. Both countries are holding their five-yearly congresses this week. Communist neighbor China has been vying aggressively for influence on Laos, however, providing scholarships, aid, loans and infrastructure investment into a fledgling $12 billion economy 862 times smaller than its own. Growth in Laos has been driven by investment, mining and sales abroad of most its growing hydropower output, largely to Thailand, which has boosted incomes and access to electricity, telecommunications and healthcare for its 6.8 million mostly rural population. State media did not state why Thongsing and Choummaly, who have been politburo members since 1991, did not contest re-election to the central committee. Foreign media has not been permitted to cover the congress. A senior foreign ministry press official said there was insufficient time to invite international media.